FAIRTONE SKIN LIGHTENING FACE SERUM!Fairtone Skin Lightening Face Serum significantly lightens the skin while simultaneously providing anti-ageing qualities, ensuring a more youthful complexion. The unique complex contains powerful antioxidants that remove age related dullness, patchiness and darkness to give you glowing fairness. Fairtone Skin Lightening Face Serum contains natural, herbal ingredients ensuring your skin has the vital vitamins and minerals needed to stay looking fresh and healthy. The active ingredients are great for lightening dark spots, age spots, sun spots, and acne blemishes. You will have a lighter, brighter complexion -fast! • Lightens skin while simultaneously providing anti-ageing qualities!• Contains powerful antioxidants that remove dullness & patchiness!• Active ingredients lighten dark spots, age spots, & blemishes!• You will have a lighter, brighter complexion -fast! • Fairtone products are clinically proven to whiten your skin tone- fast!• Fairtone products are formulated using safe and natural ingredients!• Fairtone is vigorously tested and are guaranteed to give you results!• Fairtone products are made in the UK, using high quality ingredients! 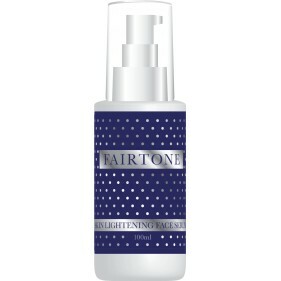 Fairtone have developed a range of skin lightening products, which have been clinically proven and are guaranteed to give you great results -fast! All products in the Fairtone range have been formulated using 100% safe and natural ingredients – ensuring your skin obtains essential vitamins and minerals needed to give you a glowing and more youthful complexion. All our products have been vigorously tested and are guaranteed to give you a lighter complexion without irritating your skin.